Gvnnerskunt are a 1 man band from Brazil that plays a very raw, necro and noisy form of satanic black metal and this is a review of his self title d 2014 album which was released by Satanic Overdose. A very noisy and distorted guitar sound starts off the album along with some grim and high pitched black metal screams along with some drum programming and very fast and raw riffing which has a more sloppy and lo-fi feeling to it which also adds to the necro and blasphemous feeling of the recording. You can hear a great amount of bestial black metal elements throughout the tracks but with a more noisy feeling than most bands of the genre and also being a bit more closer to a pure black metal sound and the programmed drums also bring quite a bit of blast beats into the tracks that are presented on the recording and all of the songs are very short with the longest one only being a little over 2 minutes as well as remaining true to an old school necro black metal style. Gvnnerskunt creates some heavy raw, necro, bestial and noisy satnic black metal with his music as well as sticking to a very fast musical direction from beginning to end of the recording, the production sounds very raw and primitive while the lyrics are written in Portuguese and cover Satanism, Luciferian and Anti Christian themes. In my opinion Gvnnerskunt are a very great sounding raw, necro, bestial and noisy satanic black metal project and if you are a fan of this musical genre, you should check out this album. RECOMMENDED TRACKS INCLUDE "Rodt Er Blod" "Satanisk Djevelen Gris" "Lucifer Drept Sin Ufodte Barn" and "Satanic Devil Pig". 8 out of 10. Laracna is a Black Metal band from the west of Paraná state in south of Brazil. An old school black metal band, similar to first wave acts. Released two demos from its birth in 2009 to present.2.So far you have released 2 demos, can you tell us a little bit about about the musical direction both recordings have taken and also how do they differ from each other? The first demo was recorded with a different vocalist, who did the sound engineering and programmed the drum machine. At the time has the first experience in a studio recording, so I tried to find how the things work and see the result. The outcome has a very poor, horrible performance from the vocalist and the mixing of the demo. So, I decided to dismiss him, work by myself and re-record the songs from the first demo with a new vocalist. The main conception for the second demo has the most primitive and essential kind of extreme music, straight the point. As a composer, I am always very self-critical to my work, and I tried to find the right riffs that would bring what I felt at the time; looking for originality and essence of this kind of music. 3.Your lyrics cover Anti Christian themes, can you tell us a little bit more about your hatred for this religion? When I wrote the lyrics I always thought to a philosophical way to broach religion/theistic themes. In the demo, I tried to link the monotheistic religions to Platonic conception of Idealism. Well, Platonic thought have a strong perspective of Idealism, especially in Euthydemus, Meno and The Republic (not in all Platonic work, Timaeus is an exemple), and this kind of tradition configures not only the Christian perspective, but the occidental world. The hatred that we can found in the lyrics is not only a critical of Monotheist perspective or other kinds of religions, but an Idealistic thought that is present in many things, to be an inherent part of Western logical thought and history. The main idea has to the listenerthought about this perceptive and interprets by himself. 4.What is the meaning and inspiration behind the name 'Laranca'? Laracna means Shelob in Portuguese, the giant spider of The Lord of the Rings by J.R.R. Tolkien. I choose that because it’s name with a strong meaning and can represent the sound of the band. 5.According to the metal archives page the band is on hold, can you tell us a little bit more about it? In 2012, after I recorded the demo Laracna, I began to work in new songs for an EP, but I had a lot of work in the University at the time; the vocalist doesn’t show interest for the band and I don’t found a drummer. So, I decided to split-up for a time to clear the head and work in some personal/professional problems. I still don’t have date to work again in music, maybe in future. 6.Has the band done any live shows or is this strictly a studio project?No, the band never did a live show, I never found a drummer in my region for the work. I work strictly in my home studio since 2011. 7.On the recent demo you did a cover of Sepultura's "Antichrist" what was the decision behind doing your own version of this legendary track? I always liked to play some covers, so I asked my friend Vizjerei Efreet to sing in a song of the demo and we choose Antichrist. Old Sepultura was a big influence to me and this song was perfect for the demo sonority. 8.Currently you are unsigned, have you received any label interest in the past? No, the band never received real interest of a label. I never had contact with people that work in the scene or labels. Contacts are much more important than material with quality for labels and live shows, and I'm sure this is the big factor at this point. Low, I don’t receive opinions from reviews, material or contacts. I have some contact with people in Paraná state, this one have a good feedback. 10. Are you involved with any other musical projects these days? No, I have an Electronic/Noise project called Katrasis, but is stagnant about two years. 11.Where would you like to see this band heading into musically during the future? Try to improve the sound quality using a real drum, more complexity in musical structure, use of different tones and perspectives. It is a very difficult question to answer. In past I listened more Extreme Metal, Old Thrash, Black and classic Heavy Metal. But I never stayed listening only one genre, I tried to understand the characteristics of each style of music to learn how to appreciate and criticize stuff. So, I listen to Extreme music as to traditional southern Brazilian music and experimental like Stockhausen and Xenakis. Nowadays is hard to tell, depends on the mood and time. This week, for example, I had listened to Bathory, Thy Light and Renato Borghetti.13.What are some of your non musical interests? I have a Bachelor's degree in History, so of course I'm have interest in this area. Philosophy, Philology, Mechanics, Physics, Literature, et cetera. I always try to learn different areas of knowledge. 14.Before we wrap up this interview, do you have any final words or thoughts? I like to thank you for the review and the interview. 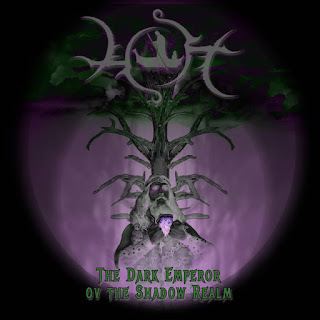 Humut Tabal are a band from Texas that plays a very experimental and occult form of black metal and this is a review of their self released album "The Dark Emperor Ov The Shadow Realm" which will be released in June of 2014. A very dark and melodic black metal sound starts off the album before going into a more fast and raw direction along with blast beats while also adding in guitar leads and keeping the melody around which leads up to the grim screams making their presence known on the recording and the band utilizes a mixture of slow, mid paced and fast parts. All of the musical instruments that are present on the album have a very powerful sound to them and the band also adds in thrash metal elements into certain sections of the recording along with some death metal growls and they display a great amount of talent and skill on their musical instruments and mix in some technical and progressive playing into black metal without losing any of the heaviness or rawness this genre creates. On the later songs death metal elements start becoming a huge part of their musical sound and there are also synths being utilized briefly in some of the songs and they bring a more atmospheric and avant garde feeling to the tracks that they are presented on as well as addign a psychedelic feeling to one of the later tunes and as the album progresses clean playing finds its way onto on of the songs and enhances the experimental feeling this band creates with its musical style as well as adding in small amounts of spoken word parts while the main focus vocal wise is on the more black metal side of things. Humut Tabal create a very original occult black metal sound with this album keeping the rawness, heaviness and melody of the genre while also experimenting quite a bit with their sound as well as showing some talented and skilled playing that is very rare in this genre, the productions sounds very professional for being a self released recording along with a few tracks that are very long and epic in length while the lyrics cover a concept revolving around a misanthrope in a past-apocalyptic wasteland who experiments with established occult practices before looking solely inward and transcending the physical and spiritual bonds of the world and human perception. 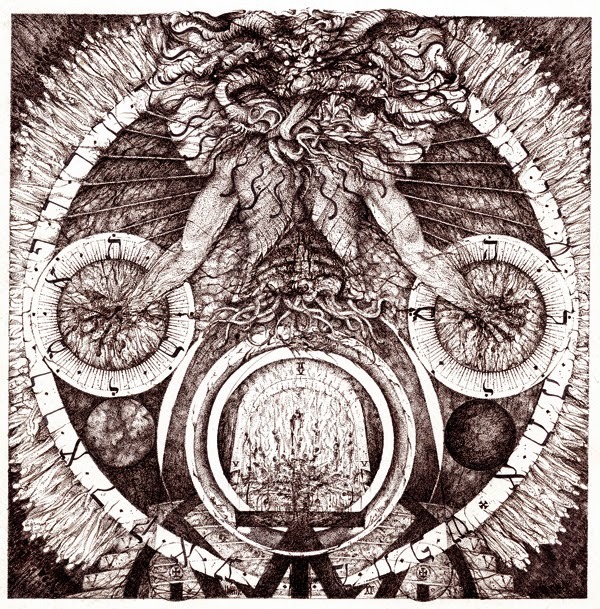 In my opinion Humut Tabal are a very great sounding experimental and occult black metal band and if you are a fan of this musical genre, you should check out this album. RECOMMENDED TRACKS INCLUDE "Across The Boundless Land Ov Death" "Alone, In Purest Silence" and "In The Shade Ov Lord Satan's Wings". 8 out of 10. Goats Of Doom are a band from Finland that plays a very experimental and occult form of black metal and this is a review of their 2014 ep "Ashes From The Past" which was released by Ewiges Eis Records. A very dark, raw and old school black metal sound starts off the album along with some powerful bass lines and atmospheric synths which lead up to some blast beats and melodies before adding in the grim vocals and screams and then the music sticks to mostly mid paced and slow parts while also having its fast moments at times. Deeper vocals are utilized in certain sections of the recording which also gives the music a more death metal feeling, when guitar leads are utilized they enhance the dark, melodic and occult elements of the recording, the blast beats on the second and third track bring a very brutal feeling to their atmospheric black metal sound and the last track utilizes a small amount of clean parts which also enhance the atmospheric of the music as well as adding in a very ritualistic feeling to the ep. 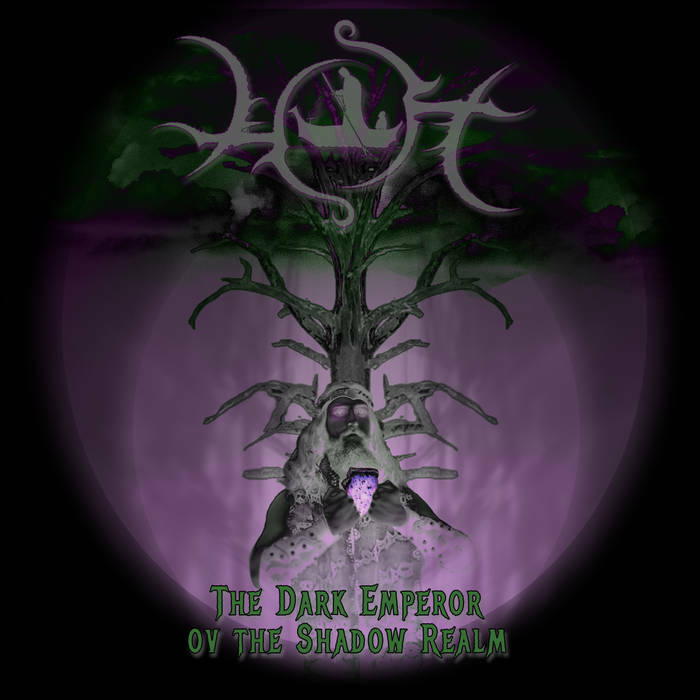 Goats Of Doom create some truly dark, melodic and atmospheric occult black metal with their music which also gets experimental at times and I am interested to hear where the band will evolve into in the future, the production sounds very dark and powerful while the lyrics cover Lovecraft, Thelema, Lovecraft, Misanthropy and Satanism. In my opinion Goats Of Doom are a very great sounding melodic, atmospheric and experimental occult black metal band and if you are a fan of this musical genre, you should check out this ep. RECOMMENDED TRACK "Lord Of the Flies". 8/5 out of 10. Verbum Verus are a band from the Netherlands that plays a very satanic and occult form of black metal and this is a review of their 2012 album "Melkiresha" which was released by Daemon Worship Productions. A very slow, dark and melodic sound starts off the album with the music having a blackened doom feeling to it which also leads up to some grim vocals and screams which also have a melodic tone to them at times and after a few minutes the music really starts going for a more mid paced black metal direction and all of the musical instruments have a very powerful sound to them. When fast parts are added into the music the album starts having a more raw feeling to it while the band is a lot more than that style along with a mixture of slow, mid paced and fast parts as well as blast beats being utilized when the time calls for it and the band also brings in a few long and epic in length. As the album progresses the black metal screams start having a more depressive feeling to them at times and the songs have a very dark and orthodox satanic black metal sound from beginning to end of the recording and atmospheric sounds are added on one of the songs and gives the music a dark dark and ritualistic feeling and the last song also utilizes a great amount of avant garde sounds and calls up the infernal names. 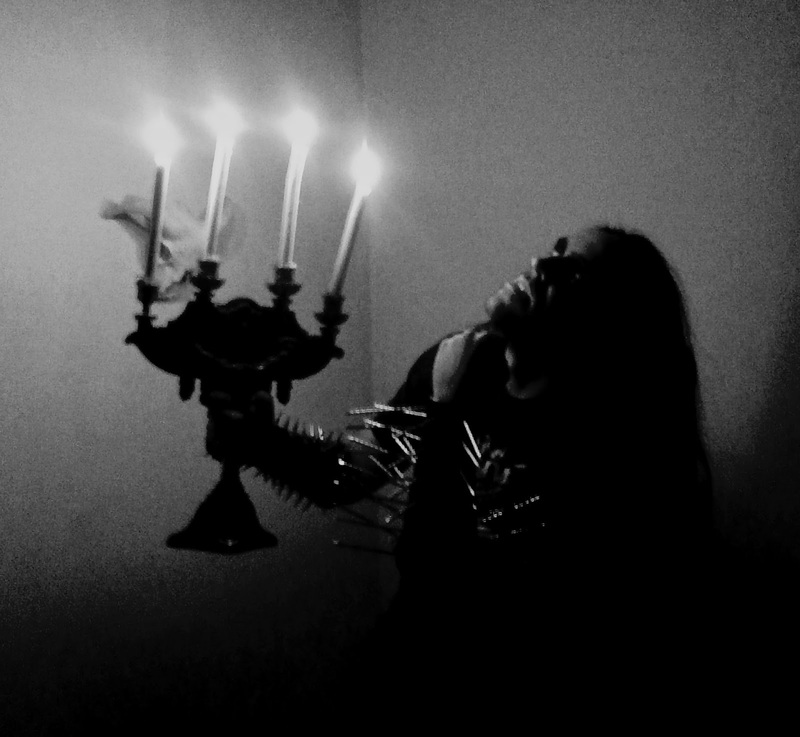 Verbum Verus create some very dark, heavy and raw satanic occult black metal with their music showing how black metal should really sound, the production sounds very dark and heavy while the lyrics cover Satanism and Occultism themes. In my opinion Verbum Verus are a very great sounding satanic, occult black metal band and if you are a fan of this musical genre, you should check out this album. RECOMMENDED TRACKS INCLUDE "The Fourth Kingdom" and "Primula Signis". 8/5 out of 10. Wrong are a duo from Spain that has been featured before in this zine and plays a very raw and depressive form of black metal and this is a review of their 2014 album "Pessimistic Outcomes" which was released by Xtreem Music. Avant garde and rain sounds start off the album and a few seconds later you can hear the voices of human torture which leads to a more heavy and melodic depressive black metal direction along with some suicidal screams and you can hear a dark atmospheric sound in the background at times. When fast parts and blast beats are utilized in the album they give the music a more raw black metal feeling and the vocals also start getting more grim as times goes on by and all of the tracks are very long and epic in length and utilize a mixture of slow, mid paced and fast parts in their song structures. Spoken word parts and whispers when they are utilized gives the music a more poetic feeling and every song has a very different sound to them while also remaining true to a raw and depressive black metal sound and on of the later tracks utilizes a small amount of acoustic guitars and the band also brings in small elements of post rock while black metal is always the main dominant factor of the recording. Wrong create a very negative and pessimistic approach to raw and depressive black metal with this album and the songs on the recording are a perfect example of what depressive black metal should sound like, the production has a very dark, raw and heavy sound to it while the lyrics cover dark, negative, hateful and depressive themes. In my opinion this is another great sounding album from Wrong and if you are a fan of raw, depressive black metal, you should check out this recording. RECOMMENDED TRACKS INCLUDE "His Hatred Breathes" and "Dragging My Soul Until the Sunset". 8/5 out of 10. 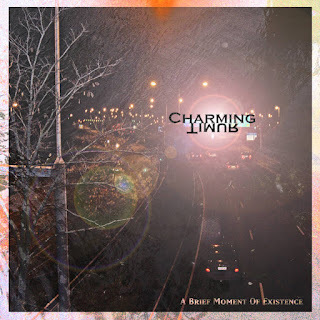 Charming Timur are a one band band that plays a mixture of post black metal, sludge, alternative and nu metal and this is a review of his self released 2014 album "A Brief Moment Of Existence". Distorted noises start off the album along with some alternative metal style riffing and a few seconds later grim black metal screams are added into the music and you can also hear some post rock melodies being utilized in the background which are also added into the solos and leads on the recording. As the album progresses elements of nu metal find their way onto the album and experimental sounds and clean singing are added into certain sections of the recording which also gives the album a more avant garde feeling and the music also starts adding in heavy doom and sludge metal parts with the more melodic side of the music that is presented on the tracks. There are also a good amount of industrial elements being utilized on the album at times as well as a few seconds of harsh noises and the vocals also start to get more deep and depressive on some of the later tracks along with traces of ambient drone and on some of the later songs the music starts adding in more post rock and shoegaze sounds. Charming Timur combines a variety of many different musical style in his music while the main influence is black metal you can also hear elements of sludge, nu metal, alternative and post rock throughout all of the tracks which also makes the music sound very original and satand out on its own, the production sounds very powerful doe being a self released recording while the lyrics cover dark and depressive themes. 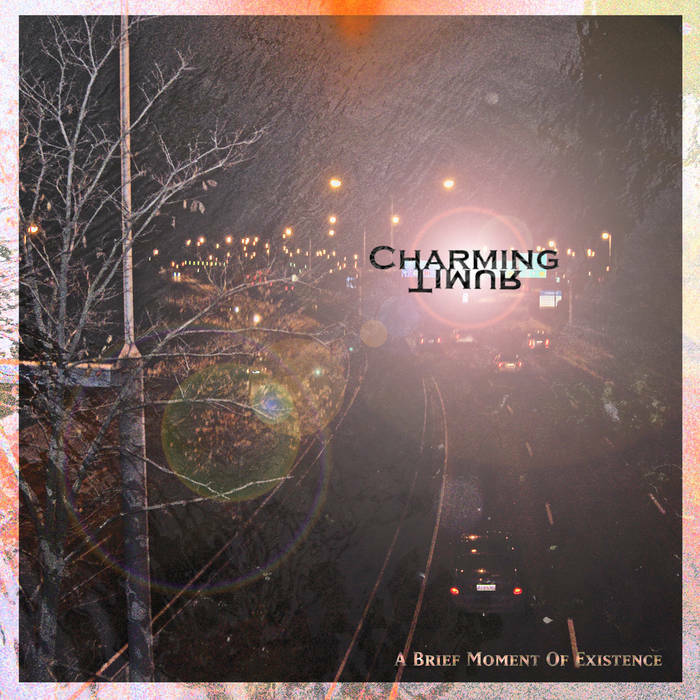 In my opinion Charming Timur are a very great and original sounding post black metal project and if you are a fan of this musical genre, you should check out this album. RECOMMENDED TRACKS INCLUDE "OCD" "My Pain" "Ego Machine" and "All The Same". 8 out of 10. 1.Can you give us an introduction to your self and your musical projects? Well, first of all I’m from Argentina. I’ve played metal for almost 8 years now, although I had the chance to start recording all my music and playing live gigs just a few years ago. Most of the music in all my projects and the bands I have been part of are really old and there are also a lot of ideas that haven’t been recorded yet that were composed when I started to play including pure death metal songs and also ambient/intrumental music. 2.You have 2 solo projects and one full time band, what are the musical styles you play with all 3 projects and also how do they differ from each other? The oldest one, which is Elysium, is Black metal with a melodic approach to it although I don’t consider it to be “Melodic black metal” but some people like to call it that way. The bands I consider to be a main influence for this project are: In aeternum, Naglfar, Satanic warmaster, Horna, Angantyr, Gorgoroth, Taake and Idjarn. On the other hand Shemhamforash is oriented to a much more brutal and dark kind of Black metal, mainly influenced by: Funeral Mist, Marduk, Katharsis, Mayhem, Watain, Profanatica, Deicide and Teitanblood. There are also a lot of ambient songs which I have composed exclusively for this project that add a lot of darkness to the whole concept. 3.With Elysium your lyrics cover ancient cultures, mythology and lost continents, can you tell us a little bit more about your interest in those topics? Well, I have to say that I try to concentrate my lyrics on mythology, ancient cultures (for me “lost continents” are included within both of those subjects) and also myths and stories that I create, which are always set on the past (mostly middle ages). The interest on these topics emerges from a deep respect and admiration that I’ve always had for the ancient cultures (all of them, without concentrating in just one), their legends and way of life, as I consider them to be much more advanced than most of the societies in which we live in today, mainly because they cared about certain aspects that are not taken into account nowadays, such as the divine, sacred and hidden potential within the human being. There was also a very interesting connection they had with nature through the myths of their gods that has always appealed to me, as I think most of them have a lot of philosophical teachings and hidden meanings that are very inspiring. In my opinion all of this knowledge has been almost forgotten, with the exception of a few people who still preach and practice most of the concepts found in that ancient wisdom. 4.With your other projects the lyrics are more in the Satanic and Occult direction, how would you describe your views on Satanism and Occultism? I have studied Alchemy, the Hermetic qabalah, grimoires and treatises related by myself since I was 13 and I slowly became closer to Satanism and the Left hand path knowledge a few years after I started to read those texts, so I decided to practice many of the rituals described on those books and begin to meditate based on the Qliphotic system. I found out that there was a lot of hidden aspects of myself and the reality that surrounds us that can be discovered through these practices and can lead you to see the essence of who you really are and what you are capable to do in this world and beyond. 5.What is the meaning and inspiration behind the names of all 3 of the projects? Elyisum’s name was taken from a dictionary of greek and roman mythology that I own and, basically, refers to a place that exists only for brave and heroic warriors chosen by the gods. It has some similarities with the Valhalla of the Vikings where only the warriors who died at battle were admitted. Shemhamforash is a Hebrew term that denotes the 72 secret names of god and is related to his Tetragrammaton or “four lettered” name which was forbidden to pronounce explicitly. It was used to invoke or evoke the forces of light or, in this case, the forces of darkness by the decryption of their names. The concept of this project, based on its name, is to summon those dark forces from other planes and the hidden aspects of ourselves (Macro and microcosm – as above so below), allowing us to create a portal between this world and the greater powers that are beyond our perception and within us. 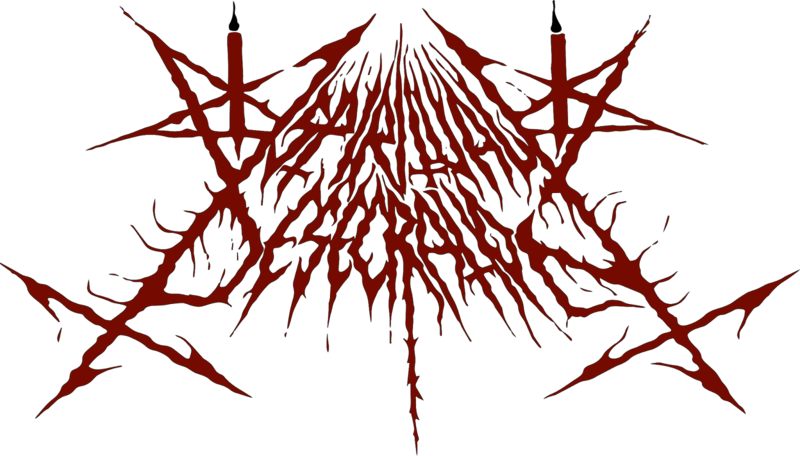 Spiritual Desecration’s name is very self-explanatory I think, because it expresses what the band’s all about: Blasphemy, Satanism, war and darkness. And it’s also very interesting because, for me, refers to the profanation of the beliefs that forbid the freedom of the human being with their false morality and absurd codes of conduct. 6.You work with a full time band on one project and do the other 2 solo, which one do you prefer, working by yourself or with a full band? I think that each one appeals to a different part of me and I find all of them very inspiring, although there’s a difference in how I enjoy each one of them, for example, In Elysium I enjoy more when the time comes to compose the music, with Shemhamforash it’s a mix between the time I record the vocals and I can hear the music already and also when I write the lyrics, while in Spiritual Desecration I have the opportunity to play with other people and include all the ideas that don’t fit in the other projects, so to sum up I would say that I enjoy both in its own way, working by myself and with the band. 7.Has there been any live shows with your band 'Spiritual Desecration' and if so how would you describe your stage performance? So far the band has played a lot of live gigs, and I have been on stage with them in two occasions, in both times I enjoyed a lot while I was playing, the sound was very good and the people seemed to enjoy the music as much as we did, so I have to say that the live performances have been great. 8.Currently all 3 of the musical projects are unsigned, are you looking for a label or have received any interest? Yes, they all have been self – released. Right now I’m promoting all these bands and looking for a serious label to all of them if it’s possible so I can concentrate more in the music and leave the promotion and distribution to people with much more experience and contacts than me. I have to add that Spiritual Desecration will appear on a split with a Mexican band called “Black Torment” through Misantropic spirit records from Argentina and the first album is planned to be re – released by a Brazilian label very soon, but we are is still looking for a label that could offer us a contract to publish all our music. Well, as regards the band, the reception has been very good both here in Argentina and at foreign countries too. About my own solo projects they have also received a lot of good comments and support here and abroad, especially from fanzines, radios and other musicians. 10.Do you have any new releases coming out later this year and also where do you see yourself heading into musically during the future with your musical projects? Yes, I’m planning to release new albums and Eps with all my projects this year and also at the beginning of 2015. I think that my main goal is to do a tour within my country with Shemhamforash, once I gather enough musicians interested on doing live gigs, together with Spiritual Desecration and maybe playing in other countries or do a South American tour if it’s possible, that would be great. About the extreme metal bands, I already answered you by mentioning the influences of each project, but I could name a few that aren’t neither Black metal nor Death metal which are: Candlemass, Danzig, The Misfits, King diamond and Mercyful fate, Iron maiden, Yngwie malsteem, Old Metallica, and Led zeppelin. As regards the musical styles I have to say that punk rock has been important for me, classical music has also been a big influence as well as doom, drone and ambient music too. I like to read a lot, all genres, from Science fiction to Philosophy and historical books too. I also like and find inspiration in paintings and drawings from different artists (old and new) such as Gustav Dore, Brueghel (the elder), Hieronymus Bosch, H.R. Giger, Goyá, William Blake, Santiago Caruso, Paolo Girardi, Caspar David Friederich among others. BECOME WHO YOU REALLY ARE, FIND YOUR OWN ESSENCE! Bland Vargar are a band from Italy that has been featured before in this zine that plays a very raw and epic form of black metal and this is a review of their 2014 cassette "Perpetual Return" which was released by Caligari Records. Dark nature sounds and winds start off the album along with some classical guitars a few seconds later and after a minute the music starts going into a fast, raw and melodic black metal direction along with some grim high pitched screams as well as adding in blast beats as well as some melodic guitar leads shortly after that. As the album progresses the band starts adding in a mixture of slow, mid paced and fast parts as well as adding melodic clean singing vocals into certain sections of the recording and they also bring back the classical guitars at times to add more variety to their musical sound as well as bringing in elements of folk and progressive rock. Whispers are utilized briefly and they bring another form of grimness into the bands musical style and on one of the later tracks during an acoustic song the band add s in a psychedelic sounding guitar lead and some of the tracks are very long and epic in length, after being in an acoustic direction for awhile the band does return full force to a melodic and raw black metal sound on the later tracks as well as adding in some very powerful sounding bass guitars and towards the end of the album the music returns back to a folk music direction. 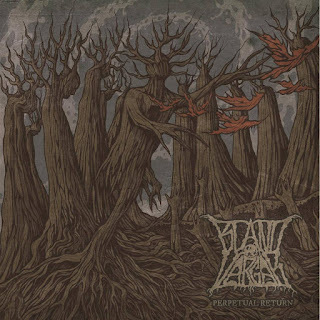 Bland Vargar create a very diverse sounding album this time around remaining true to their raw and epic black metal sound while also having more progressive rock and folk music elements in their songs, the production has a very dark, heavy and powerful sound while the lyrics cover wolves, nature and inner struggles. 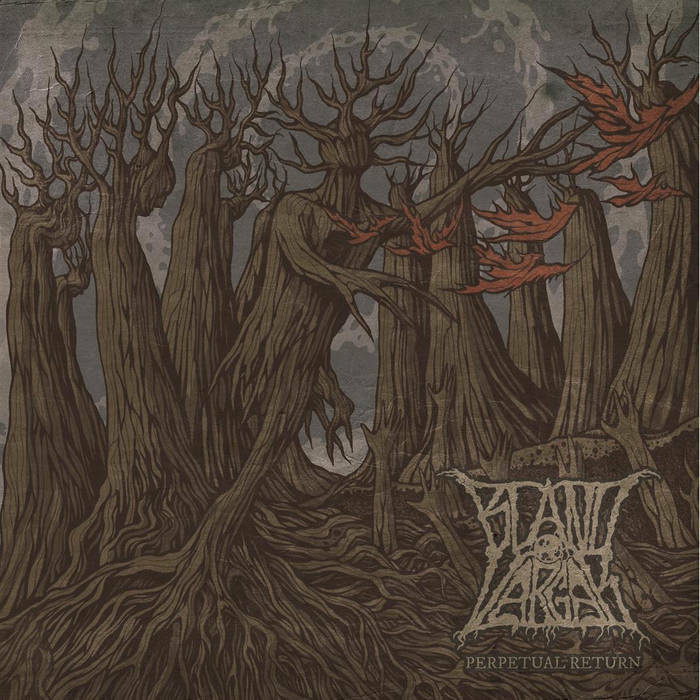 In my opinion this is another great sounding album from Bland Vargar and if you are a fan of raw and epic black metal. RECOMMENDED TRACKS INCLUDE "Bruma (Of Wolf And The Hunt)" and "Requiem". 8/5 out of 10. This is the final review of a recording from Avitas which shows the band going into a raw black/war metal direction along with a touch of psychedelia with the album being called "Northern Ghosts" and released by Bud Metal Records in the year of 2014. A very dark and psychedelic sounding intro starts off the album along with some avant garde style synths and after the intro the music goes into a very slow and raw national socialist style black metal sound along with some grim screams as well as speeding up a bit and adding in blast beats. A very raw and war like black metal sound dominates a good portion of the recording as well as injecting a good dose of the early ns black metal sound into their musical arsenal and they also utilize a good mixture of slow, mid paced and fast parts and most of the tracks are very long and epic in length. As the album progresses the music starts getting more diverse while always remaining true to a raw black metal sound and some of the later songs also add in small amounts of clean playing as well as having more elements of psychedelia mixed in their musical sound as well as a brief use of chanting and spoken word parts an d the black metal vocals are also very understand on all of the tracks that are included on the album and acoustic guitars are added briefly on a couple of the songs towards the end of the recording and they also add in a classic rock flavor. 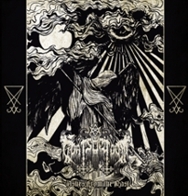 Avitas remain true to their raw ns black metal sound on this album while also incorporating more psychedelic elements this time around, the production is very raw and old school sounding in the true black metal tradition while the lyrics cover heathenism, Anti Judeo/Christian/ Abrahamic religions, Thelema, Occultism, Atheism and National Socialist themes. 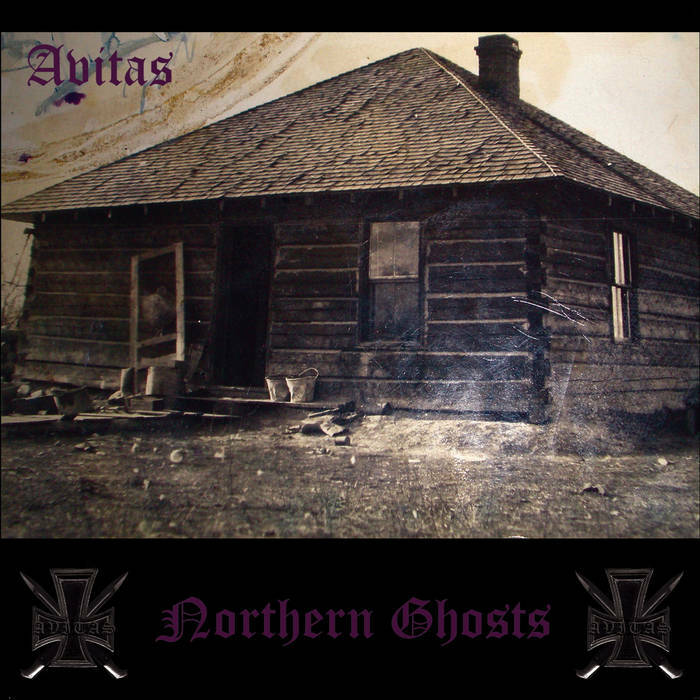 In my opinion this is another great sounding recording from Avitas and if you are a fan of raw, national socialist black metal with a psychedelic black metal touch, you should check out this album. RECOMMENDED TRACKS INCLUDE "Return Of the Heathen" "Northern Ghosts" "Aiwass" and "Boreal Nebulae". 8/5 out of 10. This is another review of an album from Avitas which shows them in the earlier stages with a very raw black metal sound that also has elements of war and death metal and this is a review of their live 2011 recording "Politics Of Nordic Terror: Live Rehearsals MMIII" which was released by Bud Metal Records. A very raw and live sound starts off the album with some dark and melodic guitars as well as some audience reception and the band also bring s in a mixture of both clean and fast parts which also leads to a more raw style of black metal along with a mixture of grim screams and deep death metal growls. The music utilizes a good mixture of slow, mid paced and fast parts along with a great amount of blast beats and the production gives the music a more raw and lo-fi black metal sound along with a very dark sounding atmosphere and some of the later tracks show a great amount of thrash metal influences in the guitar riffing. Most of the tracks are very long and epic in length as well as the death metal influence being more prevalent on this album than the future recordings they later put out with all of the tracks being recorded in 2003 and some of the later tracks shows a more melodic side of the bands material in the early days as well as having a few instrumentals that shows despite the raw black metal side of most of the material the band are very talented musicians that have a great amount of talent and skill. Avitas shows a very raw side of their musical sound with this live recording as well as a great amount of talent and skill that are better displayed on the later recordings they released, the production is very raw and under produced while also having a live feeling in its sound and th e lyrics cover political, national socialist, war and anti religion themes. 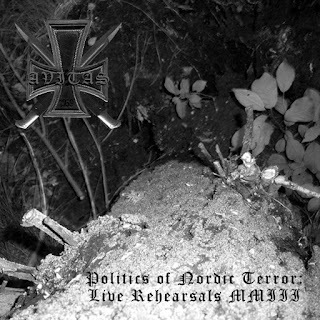 In my opinion this is a very great sounding album from Avitas and if you are looking for some true war like raw black metal with a heavy death metal influence, you should check out this live recording. RECOMMENDED TRACKS INCLUDE "Aerial" "Politics Of Global Mind Control" "Destructive Properties Of Organized Religion" and "wall-Marde". 8 out of 10. Avitas are a band from Vancouver B.C, Canada that plays nationalist form of black/war metal and this is a review of their 2009 album "Saga Of The Nationalist" which was released by Bud Metal Records. A very dark and heavy guitar sound starts off the album and after a minute grim black metal screams find their way into the music which leads to a faster and rawer musical direction and there is also an old school metal feeling present in the bands musical attack as well as a mixture of slow, mid paced and fast parts. When blast beats are utilized the music starts to take on a more aggressive war metal feeling and you can also hear a good amount of old school underground metal in the solos and leads along with some pagan style melodies and the music also utilizes acoustic guitars and melody on some of the later tracks which reminds me of the early 90's polish black metal bands. All of the musical instruments on the recording have a very powerful sound to them along with a few of the tracks being very long and epic in length and as the album progresses instrumentals and melodic pagan chanting are added onto the recording while the main focus is still on a rawer form of black metal and on the last song the vocals start utilizing a more melodic tone to them. Avitas shows a great amount of diversity with their music playing mostly a very raw form of black metal but with some thrash and war metal elements and the slower and melodic side of their music brings a very epic and nationalist feeling to the album, the production is very raw and old school sounding while the lyrics are a concept album based on a man from Germany during the years of 1933 to 1946 and how the ideas relate to modern time along with a good dose of national socialist and anti judeo christian themes. 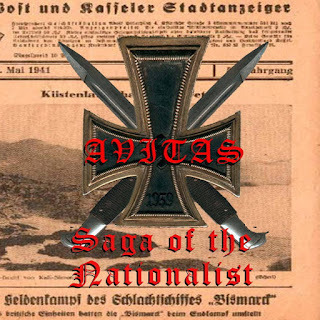 In my opinion Avitas are a very great sounding raw, nationalist black/war metal band and if you are a fan of this musical genre, you should check out this album. RECOMMENDED TRACKS INCLUDE "Apathetic" "The Militant" and "The Future I See". 8/5 out of 10. 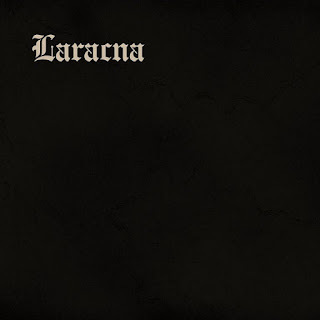 Laracna are a duo from Brazil that plays a very raw, thrashy and old school form of black metal and this is a review of their self released 2012 demo. A very raw, thrashy and old school black metal sound starts off the ep along with some fast playing and blast beats which leads to some evil growls being added into the music and the band also brings in a mixture of slow, mid paced and fast parts along with a good amount of underground 80's metal elements. The guitar solos and leads this band utilizes combines the rawest elements of black and death metal together and the band avoids having any melody in their sound which also adds to the aggression on the demo and the last track is a cover of Sepultura's "Antichrist". 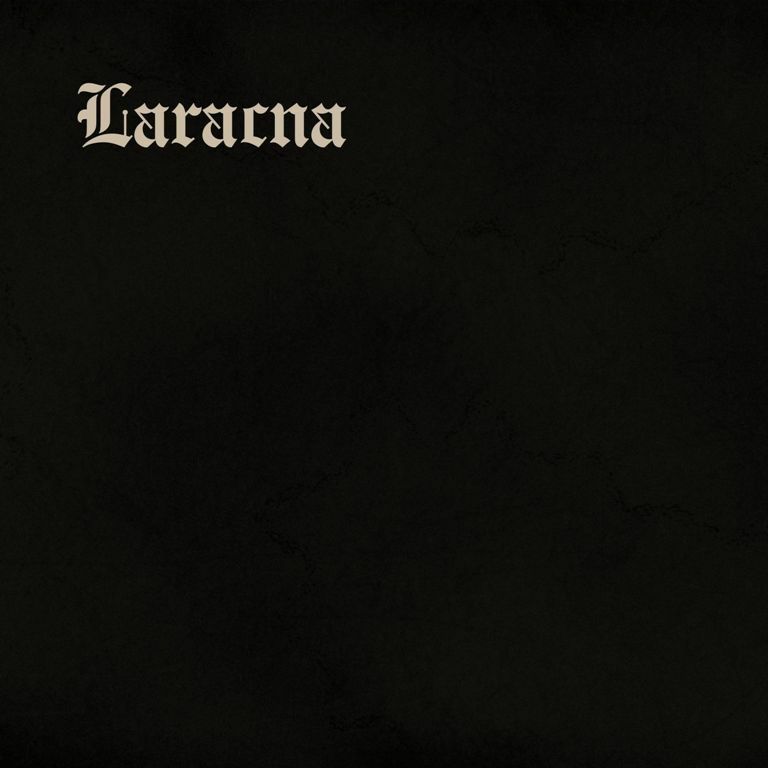 Laracna combine both the first and second waves of black metal together as well as having some old school death and thrash metal elements in their sound, the production has a very raw and demo style sound while the lyrics cover anti christian and anti religion themes. In my opinion Laracna are a very great sounding old school and raw mixture of black, death, and thrash metal and if you are a fan of those musical genres, you should check out this duo. RECOMMENDED TRACK "Cursed God". 8 out of 10. Den Saakaldte are a band from Norway that has been featured before in this zine with a musical style on this recording that combines depressive black metal with thrash, doom metal and elements of experimental and this is a review of their 2014 album "Faen i Helvete" which was released by Agonia Records. A very fast and raw black metal sound starts off the album along with some blast beats and grim screams as well as some morbid sounding melodies and the band also has a good amount of thrash elements in their musical sound and they also bring in a mixture of slow, mid paced and fast parts. When clean singing and spoken word parts are added on the album they still maintain a grim and dark feeling as well as having traces of avant garde in their sound and the guitar solos and leads the band brings onto the album are very melodic sounding and there musical style is very true to the Norwegian black metal tradition along with a few of the tracks being long and epic in length. The doom metal elements are added into the slower sections of the music and the band shows a great amount of progress from the previous recording I reviewed a few months back and almost sounds like a different band but you can still hear the depressive black metal elements when the band adds in small amounts of soft and clean playing, while the first half of the album is very straight forward the more experimental side of the band shows on the later tracks while always remaining true to their Norwegian black metal sound. Den Saakaaldte show a great amount of progress on their new album adding in a more catchy style of black metal as well as having a great amount of thrash and doom influences and the band also shows that they are not afraid to experiment with their sound, the production sounds very professional while the lyrics are written in Norwegian and cover depression, emotional and paranoia themes. 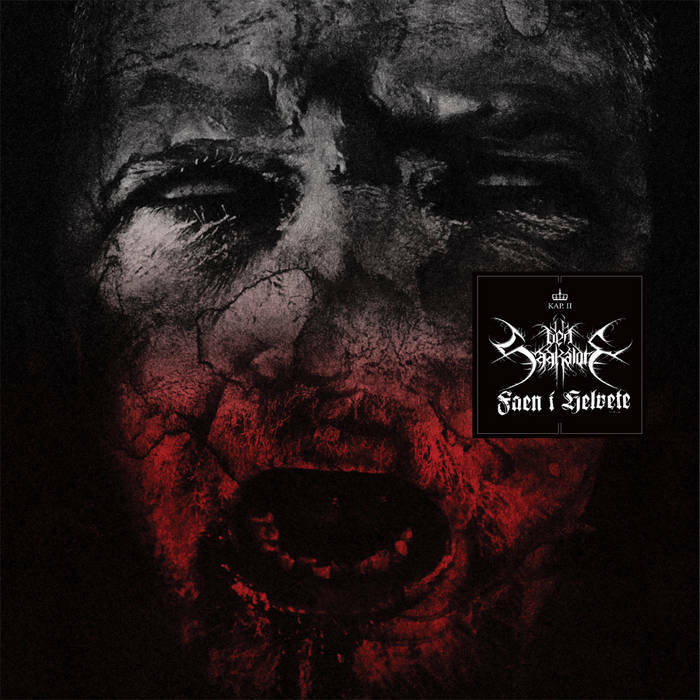 In my opinion this is another great sounding album from Den Saakaldte and if you are a fan of Norwegian style black metal with experimental elements, you should check out this recording. RECOMMENDED TRACKS INCLUDE "Din Siste Dag" "Endelost Ode" and "Ondskapens Nodvendighet". 8 out of 10. 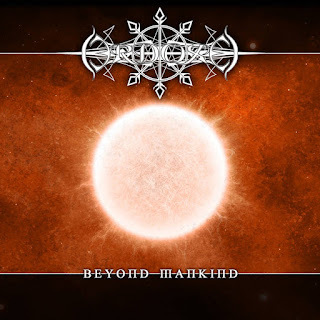 Ordoxe are a band from Quebec, Canada that plays a very raw and thrashy form of black metal and this is a review of their 2014 album "Beyond Mankind" which was released by Hymnes d'Anton. A very thrash orientated raw black metal sound starts off the album along with some grim screams and blast beats along with a musical style that has a very heavy Norwegian influence to it as well as a great amount of rawness and aggression and the guitar solos and leads the band utilizes are very melodic in sound and structure. you can hear a great amount of melody in the bands guitar riffing and acoustic guitars are also added into certain sections of the album and they evoke a dark atmosphere without taking anything away from the heavier side of their music and a good portion of the tracks add in some of the more raw elements of thrash and death metal into their melodic approach to black metal. On the later tracks there is a mixture of slow, mid paced and fast parts in the songs along with a small amount of deep growls as well as a great balance between melody and rawness and the later tracks use less thrash elements and the band focuses more on a melodic black metal sound while still having a bit of thrash in their sound and the bass playing also starts having a more powerful sound as the album progresses. Ordoxe take their thrash, raw and melodic sides of black metal and and mix them together to create their own musical sound along wit h a black'n'roll feeling at times, the production has a very raw and powerful sound while the lyrics are written in a mixture of French and English and cover darkness, power and grimness. 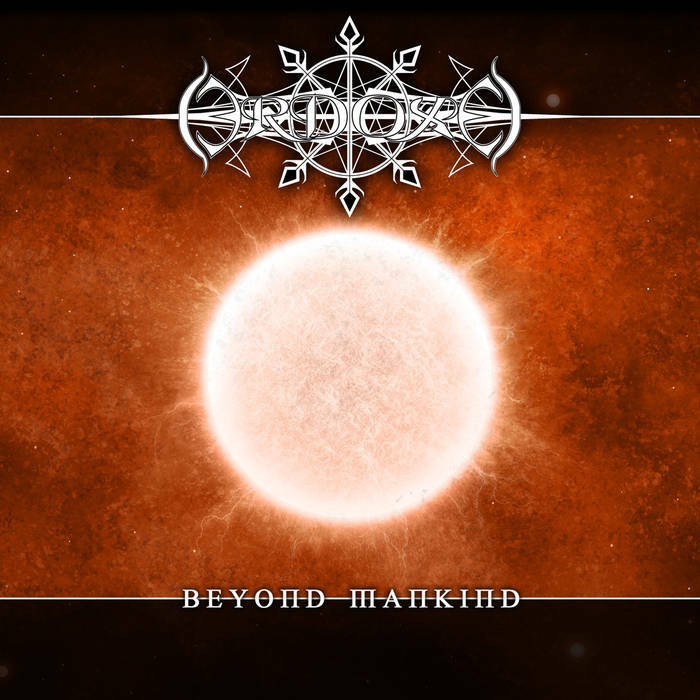 In my opinion Ordoxe are a very great sounding raw and melodic black metal band and if you are a fan of this musical genre, you should check out this album. RECOMMENDED TRACKS INCLUDE "Obsessions" "Exiled Archangels" "We Are Vermin" and "Samsara". 8 out of 10. Currently I'm in the songwriting process for our debut album. One or two songs are already finished and others await the completion. 2.A few months back you had released your first ep, how would you describe the musical sound that is presented on the recording? Well I tried to come up with a norwegian black metal sound in general and then mixed in some other elements. Atmosphere was my main focus, but I also experimented with modern influences. On our first EP, the lyrics used were poems that I had written during the months and years before. The topics are mostly death, transience of life, nature and its processes. Maybe here and there with some morbid irony included. 4.I know that the band name comes from Norse Mythology, would you consider the band pagan or heathen? There isn't actually an idea behind the band name Hjel. It came to my mind as a smoother version of the norwegian word Hel, but I didn't intend to include mythology here. I was quite suprised though, as later I found out that it is similiar to an old norwegian word for death or something. Considering that, Hjel was not pagan/heathen in the first place. But as songwriting goes on for the next release, there is a possibility I will switch a bit onto that lane, for some of the new upcoming riffs resemble the pagan era of Bathory. 5.Currently there is only 2 members in the band, are you planning on expanding the line up in the future or do you chose to remain a duo? The only instrument that is actually missing in the band is the drums. They were programmed on our first EP and yes, I plan to use real drums next time, so I will be searching for a drummer to get on board. 6. The new ep was released on Senseless Life Records, do you feel they have given your music a great amount of support? Yes yes indeed. I remember there was a second label interested in us, but the great thing about Senseless Life Records for us musicians is that they let you keep your rights on your music, as you wouldn't sell your soul that was the decisive point. And I still can say it was a good decision, they promoted our work, pressed CDs for free and offered other duties as well. It is most likely that we will stay with them for the next record. We received some positive responses for sure, people telling us that they like the music, some reviews with good grades, many downloads. I think we haven't got enough responses to firmly state that people like the music, but as a black metal musician that isn't my aim anyway, we make the music and people will like it or not. 8.Are any of the band members involved with any other musical projects? Munin also sings in a black metal band from Karlsruhe called Golgothar. I recently made up an Ambient project with the name Alhazred, of which I released the first album in April. There's still a small chance we can release our debut album in 2014, but next year seems more probable. Musically I'm currently heading towards old school black metal, like Bathory as I already said, Gorgoroth, Darkthrone... You can also expect some modern riffing and fairly melodic leads. My main inspiration comes from scandinavian black metal and from the modern german post black metal scene. I am also quite into pagan black metal, death metal in its variations and some substyles of doom. Thank you for the opportunity to have this interview, thanks to our label for great support and thanks to everyone listening to (and maybe purchasing) our music!